"I fail to understand the need for eight thousand different types of black leggings." This is 22-year-old Taylor-Anne Gallagher and her boyfriend, Tim. Taylor-Anne works part-time while attending university in Ipswich in the UK. 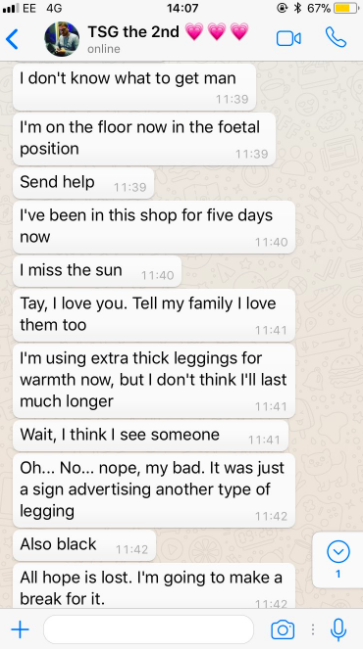 Recently, while Tim was out shopping for Taylor-Anne's birthday, she sent him a message asking him to buy some leggings for her. "I was at work all weekend and needed some new leggings and didn’t have the time, so I asked him to grab me some," she told BuzzFeed News. Unfortunately for Taylor-Anne, Tim had never bought leggings before and was more than a little confused by the situation. 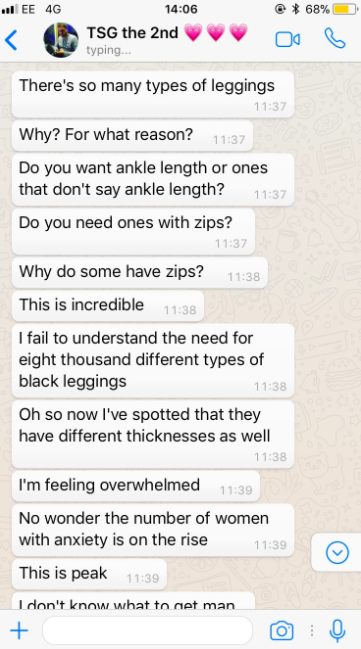 Struggling to understand just which leggings Taylor-Anne wanted, Tim sent her a series of hilarious texts documenting his struggles. "There's so many different types of leggings," wrote Tim. "Why? For what reason?" "Oh so now I've spotted that they have different thicknesses as well." On Monday, Taylor-Anne tweeted about Tim's struggles and it quickly went viral. Thousands of people responded to Tim's text messages saying they know the struggle is real as Taylor-Anne's tweet picked up over 10,000 retweets. Despite the drama of it all, Tim did end up getting out of the shops with the leggings. "Some guys do struggle to know what us women want at times," said Taylor-Anne. "A lot of the replies have been people relating and just appreciating him and telling me what a good boyfriend I have, which is lovely as it’s come from both girls and guys."